Leon Lai and Faye Wong in Leaving Me Loving You. The Skinny: A glossy, beautifully-mounted romantic drama which oddly lacks both romance and drama. The photogenic stars and sumptuous production values go a long way towards making the film pleasing to watch, but the surprising emotional emptiness could leave audiences cold. Leon Lai steps behind the camera to co-write and "creatively direct" Leaving Me Loving You, an uncommon Hong Kong romance from director-writor Wilson Yip. Co-starring Heavenly Queen Faye Wong, the film is a breakup and makeup romance about two uncommunicative Shanghai yuppies who take their sweet time to discover whether or not they want to stay together. The film also stars modern Shanghai, which is presented in a stunningly attractive, though somewhat ridiculously bourgeois manner. It's great that the city looks like such a nice place to visit, because it helps compensate for the fact that the actual nuts and bolts of Leaving Me Loving Youthe supposed romance between the lead charactersis underdeveloped and as passionate as a brick. Oddly enough, the locations upstage the stars. Lai is Zhou Qian, an outpatient doctor working the streets of Shanghai from his SUV. 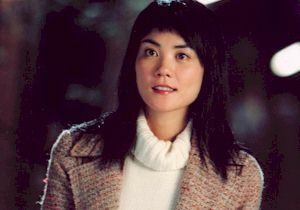 In the film's opening scene, he plans to break up with professional party planner Xin Xiaoyue (Faye Wong) because, as he puts it, "she moves faster than him." She does him one better and verbally douses the relationship, leading to an ominous voiceover from Zhou claiming he "wasn't sure why they broke up." Fast-forward to a small time later, and both are trying to get over their breakup while making ends meet in their respective professions. Xiaoyue picks up a lucrative new account in an elderly tycoon, whose family is planning the birthday party to end all birthday parties. Unfortunately, given the gentleman's quesionable health, Xiaoyue has to pass all her plans by the family physician. Verbal affirmation for those who didn't see it coming: the family physician turns out to be Dr. Zhou. Now might be the perfect opportunity for the two to rekindle their romance. However, they don't. Instead of finding the opportunity to spend more time together, the two ex-lovers spend their time heading in opposite directions. Xiaoyue shuns Zhou, who despite his cool demeanor starts to take on the disposition of a hurt puppy. Zhou, in turn, begins to find some rekindled affection for Xiaoyue, though it's never verbalized. 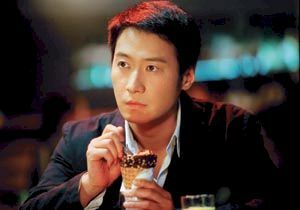 Instead, we see it in Leon Lai's puppydog eyes and his new fascination with following Xiaoyue around. Previously the two were neighbors, but Xiaoyue moved out for newer digs. When he discovers that Xiaoyue is gone, Zhou seems disappointed. However, when she shows up on a commerical jumbotron while he's eating lunch, he's able to follow her and discern where she now lives. Then he moves into the apartment across the street. We must pause to applaud Zhou's stalking technique. Except it's not played as stalking. Zhou's choice to move close to Xiaoyue is presented in the most innocuous, blithely romantic way possible. Basically, he wants to be close to her and start anew, a fact he finally relates when he rushes across the street to fix her door. You see, there's a storm that literally blows her apartment door off its hinges, which gives Zhou the opportunity to run right over and get to work with his hands. He also drops off medicine for Xiaoyue to fix that bad cough of hers, and consistently treats her with respect and obvious care. In turn, Xiaoyue plays the ice princess to the hilt, a stunningly terrible fate considering it's Faye Wong at Xiaoyue's controls. Then...nothing happens. That's right, nothing. The two go about their lives, Zhou striking up a closer friendship with the elderly tycoon, and Xiaoyue continuing to plan the amazing birthday bash, complete with personally-appointed fireworks display, massive highrise location, and an automated chair which elevates its user a good ten feet above everyone else. It's like a movie romance nirvana. Leaving Me Loving You is rare for Hong Kong Cinema because it tries to evoke feeling cinematically, and not verbally. Wilson Yip directs the proceedings at a slow, languid pace which asks the viewer to discern what each character feels via the tiniest snippets of dialogue or actiona commendable approach considering the usual bombastic, over-verbalized stuff which passes for romance in Hong Kong film. Furthermore, the lovely camerawork and maudlin, but effective use of montage (to the overused strains of Henry Mancini's "Moon River") pushes the expected emotional buttons. The impressive skyline, attractively paved streets, and upscale commerical locations of urban Shanghai are the icing on the cakeeven though much of the details seem to be reserved for Shanghai residents with obscene amounts of money (Your own personal fireworks display? A chair which elevates you ten feet above your peers? Who can afford that crap?). With all the visual and audio tools at their disposal, Leon Lai and Wilson Yip manage to portray their modern Shanghai location as an enchanting, almost otherwordly urban playground. Still, no amount of glossy artifice can mask an empty story and characters. Zhou and Xiaoyue are as frustratingly uncommunicative as they are incredibly attractive. Much is supposed to be gleamed from the awkward silence and slow makeup dance of the two ex-lovers, but the result is a lack of chemistry between the actors, and a painfully obvious lack of depth. While the slow pace may be commendable in a Hong Kong Cinema historical sense, it doesn't necessarily do much for the film. Leon Lai and Faye Wong are certainly nice to look at, but neither does much with their reduced dialogue and abundance of heavy close-ups. Their characters are supposed to regret their breakup, which can easily be ascertained thanks to the ample opportunity given to the audience to figure it out. Given their mopey behavior, the two are either hurt emotionally by the loss of love or are simply dead people at their cores. You decide. The lack of character development ultimately alienates us from them. Are we supposed to root for Zhou and Xiaoyue to get together? If so, there needs to be a better reason than the fact that they're played by Hong Kong megastars. Given their characters, both actors are convincingly remote, but neither is winning or seemingly approachable. To make up for the lack of overt emotion, we're given subplots and supporting characters to flesh out the lead characters. However, the subplots are minimally interesting, and sometimes questionably necessary. Zhou encounters a beautiful traffic cop who obviously has the hots for him. Whoopee. The past loves of the elderly tycoon are also given great attention, but the purpose seems to be little more than further montage opportunities and pseudo-emotional cinematic interludes. This is all very great stuff to look at, but it's as affecting as the birthday cards you got last year. Notes:  Though questionably in sync, the dialogue was shot in Mandarin. Considering the fact that the film takes place in Shanghai, that only makes sense.  Korean actress Lee Na-Young has a pivotal cameo in Leaving Me Loving You. She previously worked with Leon Lai on the awful sci-fi flick Dream of a Warrior.